It is important to have some basic information regarding protection of your family’s possessions in case of fire, flood, earthquake, etc. Knowing how to prepare for such situations is crucial when you only have a few minutes to leave your residence or workplace and want to know what to take. Sort through any valuable items and, to the extent possible, photograph treasured items and make photocopies of documents. The duplicates should be placed in a separate box from the originals and preferably stored at another location (a relative’s house or workplace, for example). Alternatively, digital images and scans can be saved to an external storage device, like a hard drive or USB drive, and kept in a different location for back-up. Keep photos in archival albums that are easy to grab, such as in a bookcase or storage box that is accessible. Place labels on the outside that identify the contents, written in pencil or permanent pen ink. Graphite is stable in water. Felt-tipped pens and markers will bleed with moisture and fade over time. Keep storage boxes away from water pipes (water heaters too) that could break and flood on your treasured items, causing water and mold damage. For framed art and documents, make sure hanging hooks and wires are strong, oversized and well anchored into the wall or moulding. I can’t tell you how many artworks and frames require repair because the wires give way or an earthquake shakes them loose. When they fall it can be onto a corner of a table or through a vase. Acrylic glazing is preferable to glass because it won’t shatter and damage the contents of the frame. You may need supplemental insurance for earthquakes. Make sure your homeowner’s policy covers your contents. Heirlooms should not require a Fine Arts rider, but should fall under your regular homeowner’s policy. You will still need photos and values for a claim, and for important items that have been purchased, a copy of the sales receipt with date, description and price is important to have. For a quick “visual inventory” of your home’s contents, make a video. Schultz, Arthur, ed. Caring for Your Collections: Preserving and Protecting your Art and other Collectibles. Harry Abrams publication. Long, Jane & Richard. Caring for Your Family Treasures. Heritage Preservation, Harry Abrams publication, 2000 paperback. Paper in general is highly reactive to light, heat, humidity and acids (both airborne and in adjacent materials). It is absorbent, easily torn and inherently fragile. All paper-based items should be handled as little as possible; they should stored or displayed in an environment that doesn’t contribute to their demise. Attachments such as tapes, hinges, enclosures, etc., should be of acid-free materials. The best protection for art is an archival quality mat or folder, a well-constructed frame with UV filtering glazing, or flat storage in a well-ventilated area. Paper will age more slowly if it is made of 100% cotton fibers and is free of bleaches, artificial brighteners, surface coatings and other fillers. Choose papers with the highest content of cotton fiber, known as ‘rag,’ and ones that are acid-free. Ideally, the best paper would be an all-rag paper with a pH of 7.5 or higher. All materials that are in contact with the artwork should be similarly high quality (acid-free, buffered with an alkaline compound, like calcium carbonate) so as not to affect the paper adversely. 1. LIGHT: all forms of light, whether sunlight, incandescent, fluorescent, halogen or LED are harmful to paper as well inks and colors. Depending on the fiber content, paper can darken and become brittle, or bleach and fade. Even indirect sunlight can, over time, be damaging to all the components of paper and media. Use of Ultra-violet filtering acrylic or glass will reduce light damage, but framed artwork should be always hung in indirect light. 2. HEAT: heat will dry out and embrittle paper, causing it to shrink and distort. Do not hang works of art near any source of heat or place a lamp near the surface. 3. HUMIDITY: relative humidity above 70% encourages mildew or staining on paper. It will also cause paper to expand and/or distort. Avoid hanging art on damp or ‘outside’ walls, but if you do, place bumpers on the corners of the back of the frame to hold it away from the wall, so air can circulate behind it. Make sure there is space between the art and the glazing (glass or acrylic). 4. ATMOSPHERIC POLLUTANTS: Air contains a number of gases that deteriorate paper (such as ozone, sulfur dioxide, carbon monoxide, nitrogen oxides, & lead). Framing an artwork greatly reduces exposure to these pollutants and will limit the changes in heat and humidity that occur in unregulated rooms. Storage in acid-free boxes or folders, in drawers, will provide reasonable protection as well. Non-archival backing boards, including all ordinary color matboards, corrugated cardboard, Masonite, plywood, manufactured fiber boards; felt-tipped pens (which fade easily), and ball-point pens which are not stable in light or in the presence of moisture. Regularly here at ZAC, we’ll get calls inquiring about whether or not we can work on a piece that’s been drawn, printed, or painted on ‘rice paper.’ Since this is almost never true, we thought it’d be a good idea to write a post uncovering the myth of rice paper in the fine arts. Japanese papers are commonly referred to as ‘rice papers’, a term that is both incorrect and misleading. Papers from Asia and Japan in particular are not made from rice at all, but from plant fibers formed into sheets. The Japanese have traditionally made paper from three different plants – KOZO, GAMPI and MITSUMATA. These plants all are characterized by long, strong fibers that impart the distinctive characteristics Japanese papers are known for – thinness, flexibility and strength. They have been used historically for art, calligraphy printing, collage, bookbinding and screens. More contemporary applications have included lighting and architecture. KOZO derives from a variety of mulberry plants; the majority of handmade papers from Japan are made of kozo. MITSUMATA has the shortest fibers of the three plants used in papermaking and produces a soft dense paper that is warm in color. The shrub is indigenous to Japan. GAMPI is the rarest of the three trees used for papermaking and one not easily cultivated; it mostly grows wild. 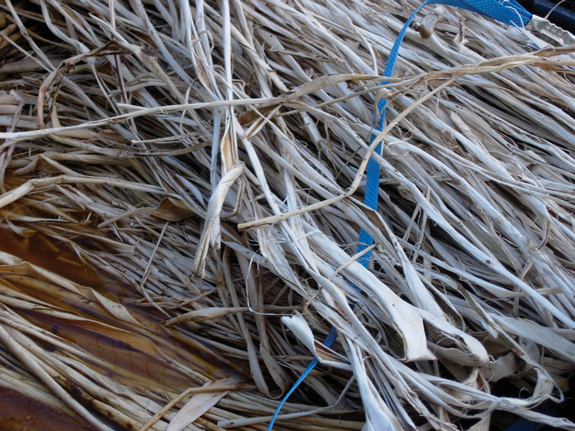 Gampi papers are made from the inner bark of the gampi bush and the finished sheets are known for their sheen and transparency. Gampi papers are excellent for printmaking, especially chine colleé. There is a material which is also sometimes referred to as ‘rice paper’ because is comes from the inner core of the Tetrapanax papyriferum (rice paper tree). It is a non-fibrous, pith-like material cut from the inner core of the tree and split into thin layers which when dried can be written or painted on. It therefore is not manufactured in the same way as sheets of paper are but is a surface that is used as a writing material. In conservation, Japanese paper is celebrated for its inconspicuousness and strength. At ZAC, we use it every day to treat and mend tears, and as a support for lining fragile works on paper. There are, of course, plenty of more beautiful applications of this material. While most conservators spend their days immersed in the technical/mechanical processes of repair and preservation, we are also considering the deeper concerns about the work we do. Is our job to recover, discover or pass judgment on an artifact? Does the value of objects in the present depend on or reflect the value of objects in the past? Do people in the present decide what the value is of those possessions their ancestors kept? Does the owner convey the importance of an object and therefore ask us to ‘save’ it? Or do we tell the public what is valuable by our willingness to care for it? What is our role, if any, in preserving culture? Samuel Jones: In a Material World; the relationship between culture and policy.